Hatsune Miku is the rarest kind of pop star. She is enduringly popular in her native country of Japan. She has never been photographed stumbling out of night clubs in the early hours of the morning, and never had issues with drugs or alcohol. She has, in fact, never been seen outside of her concerts at all. This is because Miku is also the fakest kind of pop star. She is a hologram. More accurately, Hatsune Miku is a digital avatar. Wikipedia describes her as a "singing synthesizer application with a female persona," created by Crypton Future Media. Using Yamaha's Vocaloid software, anyone with enough technical know-how can program Miku to perform any song on a computer. In Japan, where synthetic characters -- such as Hello Kitty -- are often far more enduring than real celebrities, Miku has been a huge hit. The holographic star has performed multiple sold-out concerts in her home country and abroad. 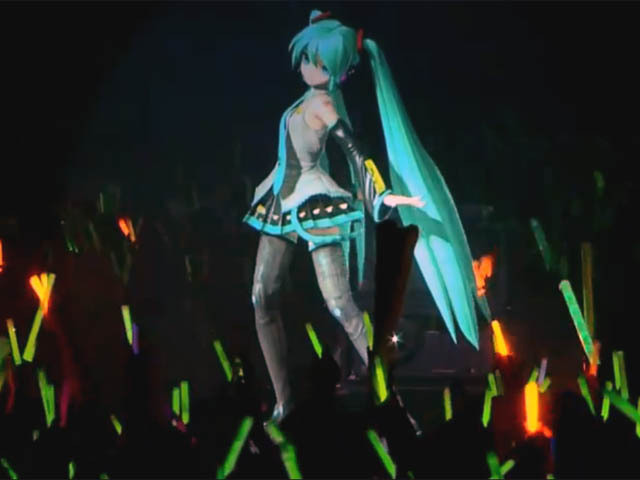 Projected larger than life on a screen, Miku sings and dances according to the direction of programmers who "choreographed" the concert weeks or months in advance. The stark unreality of Hatsune Miku doesn't seem to bother her fans at all. "It doesn't take a human to sing a good song," one fan told Wired contributor James Verini. Verini also notes that Miku is portrayed on her fan site as being better than human. "She's rather more like a goddess: She has human parts, but she transcends human limitations. She's the great post-human pop star," Verini reports one site reads. Part of the adoration comes in part from the crowd-sourced nature of Miku's stardom. Vocaloid allows any aspiring songwriter to use Miku's voice on their song. As a result, the songs Miku "performs" in concert are all fan-written. In fact, Miku's entire persona has been created by fans. The character originally started as little more than a corporate mascot in 2007. Crypton Future Media, like many corporations, wanted a face to go with their product -- in this case, their newly designed virtual voice program. Japanese graphic designer Kei drew a 16-year-old girl with flowing blue hair named Hatsune Miku -- Japanese for "first sound" and "future," respectively. With little else to go on, fans of the Vocaloid software made Miku their own, and the digital avatar quickly took off. Crypton Future Media chief executive officer Hiroyuki Itoh estimates that there are 3,000 Hatsune Miku songs on Japanese iTunes and Amazon. This is in addition to the thousands upon thousands of YouTube videos featuring the azure-haired hologram. In a world where hip-hop icon Tupac Shakur can appear on stage via hologramover 15 years after his death, the idea of a digital pop star is perhaps not as far-fetched as it seems. For fans, creating and sharing content is as much a part of the experience as the singer herself. When the concert lights go down and the pop star appears on stage, the emotions of thousands of screaming fans are as real as it gets.